Darth Vader would approve of this shadowy interior. After revealing the Continental GT Timeless Series last week, Bentley has given its flagship Flying Spur V8 S sedan the special edition treatment with the new Black Edition designed for customers seeking a luxury performance sedan with "a more dynamic aesthetic." At first glance though, there’s little that suggests this special edition Flying Spur V8 S is worthy of the sinister Black Edition name, however. 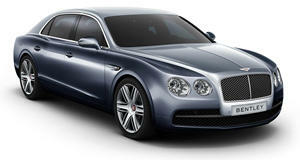 Considering how brash Bentleys usually are, the cosmetic changes are rather subtle. The headlights and taillamps have a dark tint and black bezzels, while gloss black trim surrounds the windows, door mirrors radiator, headlight washer caps, and door-handle inserts. Also unique to the Flying Spur V8 S Black Edition are seven-spoke 21-inch alloys coated with a black finish available with a choice of either black or red brake calipers. It’s inside the shadowy cabin where the special edition Flying Spur earns its Black Edition name. The interior is predominately black with contrasting red stripes of stitched leather running up the center panels of the seats and through the center of the headliner. Darth Vader would approve. As standard, you get a three-spoke Sport Plus steering wheel and a Piano Black veneer. If the interior isn’t lavish enough for you, you can also opt for the higher0spec Mulliner Driving Specification, which adds diamond-quilted seats and door panels with contrasting stitching and 21-inch five-spoke wheels in either gloss black or dark tint finishes. Being based on the more potent Flying Spur S model, the Black Edition is powered by a 4.0-liter biturbo V8 packing 521-horsepower and 502 lb-ft of torque that propels the luxury sedan from 0-62 mph in 4.9 seconds and on to a top speed of 190 mph - impressive performance for a car that weighs 5,300 pounds. Power is sent to all four wheels with a 40:60 rear-biased torque split.